The DAX is an European index comprised of the 30 largest and most traded companies in Germany. 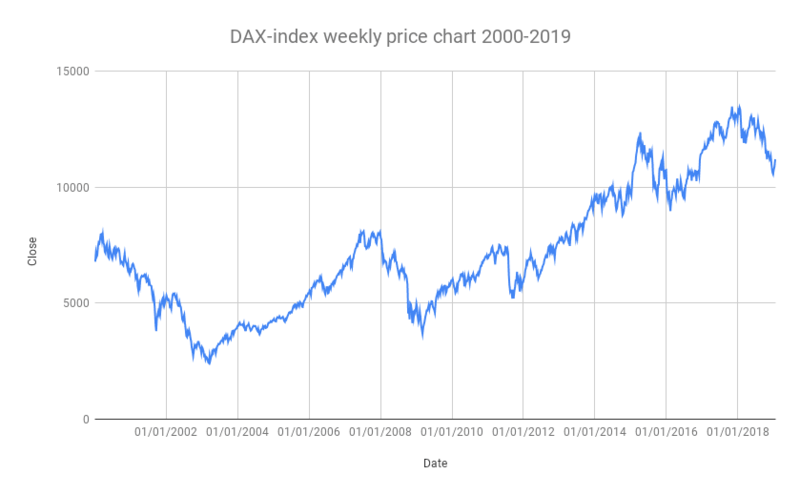 The DAX-index can be a source for investors that are looking for European blue chip dividend stocks. Germany is considered to be one of the strongest economies in Europe. The DAX contains only one true Dividend Aristocrats. The base date for the DAX is 30 December 1987 and it was started from a base value of 1,000. The DAX -index was created by Frank Mella a former business newspaper editor. Half of the companies listed in the DAX index have been in the index since the launch date. The constituent companies of the DAX went unchanged for five years (1990-1995) and in total, there have been 53 companies included. In 2018, the companies Wirecard and Covestro were added to the index, replacing Commerzbank and ProSiebenSat1. 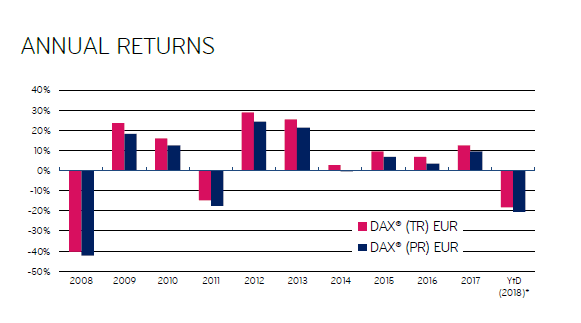 The Dax Performance Index (yahoo code: ^GDAXI), is a total return index, so includes the impact of reinvested dividends. 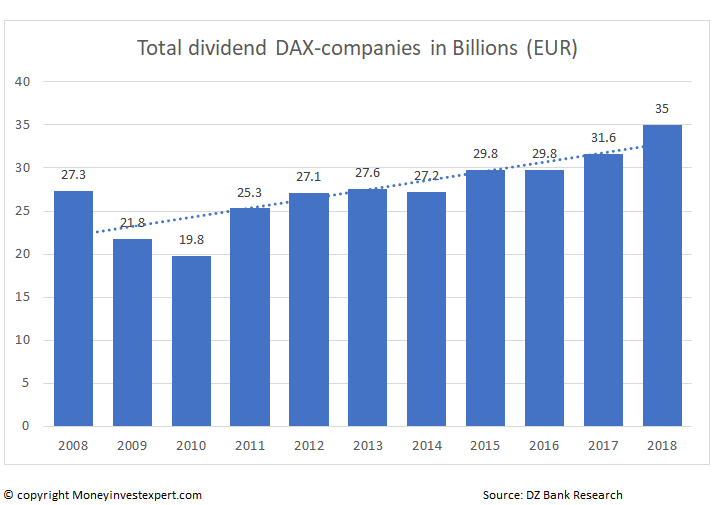 Looking at the dividend factor, the DAX related companies dividend payouts for 2017 will reach a total of €35 billion ($41.8 billion). This is the biggest payout ever in the DAX-index history, up €4 billion (+12%) compared to the year before. For non-European investors it is important to know that dividends are somewhat different than in the US. Dividend pay-outs (ex-dividend) are often once per year in April or May. Unlike the dividend aristocrats, it is also not common to increase the dividend year by year. Only one stock as part of the DAX-index managed to increase the dividend pay-out for 25 consecutive years in 2018. This is the company Fresenius (ISIN:DE0005785604), making it one of the few real Dividend Aristocrats in Europe. All other DAX companies had a pause or even decrease in dividend pay-out in the last 10 years. Please download and consult the DAX dividend index for the latest dividend and dividend yield per company. In the excel, one can easily sort of for example dividend yield, PE-ratio or market cap. 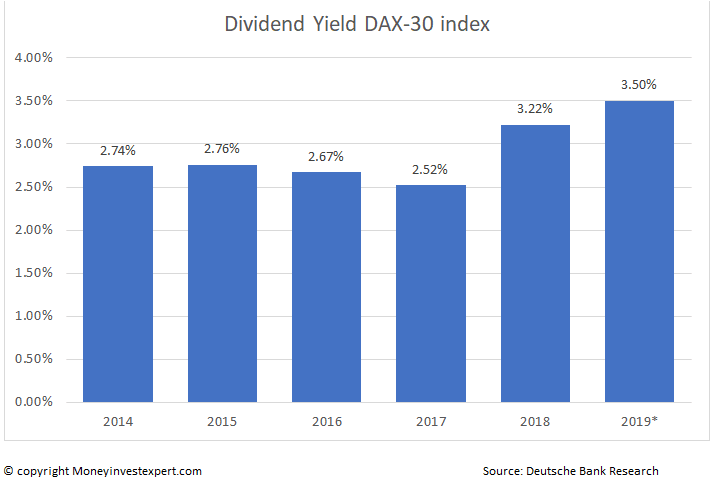 The average dividend yield for the DAX-30 companies is around 3.25% and expected to increase to 3.50% in 2019. Mid March 2015, the DAX index first closed above 12,000. The current all-time high is 13,559.60 on Tuesday 01/23/2018. As explained the European DAX Index currently contains 30 stocks . As you can see below, the Chemicals sector accounts for 15.9% of the index. 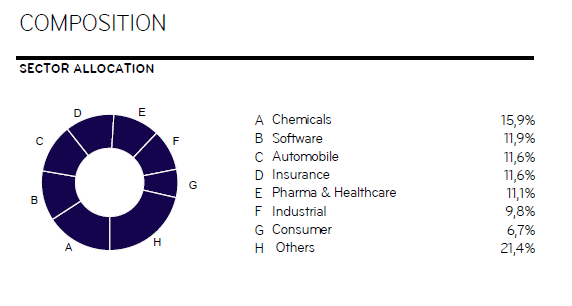 The Consumer sector is on the other end of the spectrum at 6.7% of DAX Index. To compare, the largest US dividend aristocrats sector is Consumer staples.